NEW! 28 March 2019: starting a “What Works at the Beach” category of blog posts. These are ideas for the home that have worked for us here. Take a look at the intro page or click “What Works at the Beach” in the Categories list at the right. Just starting 20 January, 2018. Every now and then I get a thought that I really want to write down somewhere. I’ve owned this domain for a long time (back when we rented the house to vacationers), and it’s time to put it to some use. 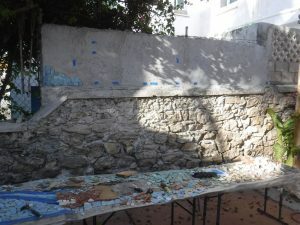 I’m going to start with the creation story of La Sirena (The Mermaid), a mosaic tile project for an ugly cement-block wall in the backyard. I’ve never done a mosaic before, so it would make sense that my first project would be something maybe a foot square on a piece of wood to hang up in my workshop (where nobody has to see it). But no, La Sirena is about 3 feet by 13 feet and will be a major design element of the backyard. I started the project in April 2017, using broken tiles found on the beach by us and others. I laid her out on three tables placed end-to-end, and there she sat for about 7 months while many other projects around the house got done. Now it is January 2018, and today I was shown how to use the pegamento azulejos (the adhesive mortar; Mexico’s version of thinset) and we put about a square foot of random blue tile up on the wall. This story will be told in pictures done as blog posts, under the Category “La Sirena.” START HERE and let’s see what happens! I would be happy to answer questions about this project! I’m not opening Comments on this blog; it just gets really messy with unwanted messages. Feel free to send them to my Yahoo.com mail account called sierradave . I’ll let you figure out (easy!) what that full Email address will be.